Also: RABBITS! 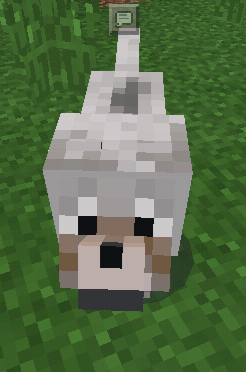 I’m seeing rabbits in Minecraft PE! The good part is, they’re cute, and they look different, depending on what biome they spawn in. The bad part is, THEY EAT YOUR CROPS JUST LIKE IN REAL LIFE! Day-yum! ANYWAY, I finally caught a bone and tamed a wolf and took him home. Here he is, sitting. I can’t get a better picture of him because, when he stands, he runs, and, when he sits, he turns to face me. So this is it. I have to make him sit whenever I’m doing anything, because otherwise he runs into the pick or whatever. He jumps into any water around and gets out and shakes himself off right next to me. Yep, he’s a dog! I named him Fiddy, short for fifty cents, ’cause a Buck just ain’t worth what it used to be, right? I’m posting today at Fatal Foodies about glazed butternut squersh squash. YUM! A WRITING PROMPT FOR YOU: What does your main character do to honor the Winter Solstice? This entry was posted in Geek. Tagged gaming. #SampleSunday AND 1st of Month AND A-to-Z Blogfest!!! I just had a great butternut soup, made by my friend across the street’s grown up daughter. It was delish! Butternut soup is YUM, indeed! Grown up daughters can be, as Grandpa used to say of anything he liked, handy little gadgets. P.S. Didn’t mean to make it sound like your dog would be delish. Thanks. I always need a larf.